Hello again! This is Darci and Lacey from Pastthyme Patterns with a really quick and easy table runner project using those ever popular candy squares!! This project comes just in time for the holidays. 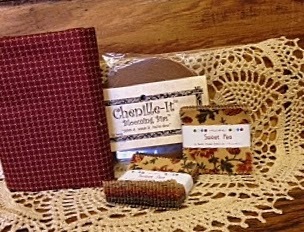 It is fast project to complete for that last minute holiday gift. . .or final decoration on your holiday table. Finished project measures approximately 12″ x 28″ in size. 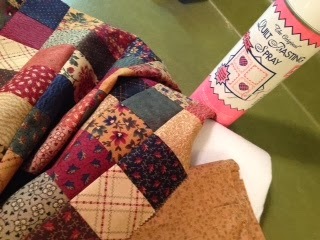 To follow more of our quilting adventures you can visit our website www.shadesofpast.com where you will find links to our Pastthyme Patterns collection, blog, Facebook page and online site where kits of this fun project can be found!! Begin by opening up those cute candy squares and laying them out in a 6 down by 14 across layout (as shown above) Sew together the rows to create your table runner quilt top. Now we are going to add the Chenille-It. . .you know that fun fuzzy stuff!! 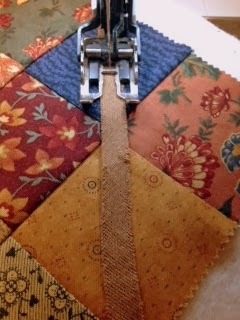 By putting this on the layered runner you will essentially be “quilting as you sew” the Chenille-It on. Before I explain how to add the Chenille-It on the runner I want to point out a couple helpful hints. Remember that just like the package states, the Chenille-It is cut on the bias. It will stretch out if you pull on it while you sew, while I think over-stretching this is impossible for this project I suggest stretching it in moderation. It is also spliced together so that you get one long continuous 25-yard roll. You will notice that there is a “right” and “wrong” side to the splice. Ideally you want that splice to be raw edges down but DO NOT WORRY if you end up getting your piece twisted and it ends up being right sides up. When you rag up the Chenille-It, nobody will ever be able to spot where that splice is!! (Trust us…we speak from experience!!) It’s not worth the ripping time! Now the fun part! Place your table runner on a nice, flat surface and grab your Chenille-It and scissors. Referring to the photo above you will notice that we opted to skip every other row. We did this on purpose to sort of give this project a lattice effect. You can pick any of the four corners you choose to begin with. (I am going to direct you from the upper right) Skip the upper right square. Place the start of your Chenille-It in the upper left corner of the second square and run it down, diagonally to the bottom second lower right square and cut flush. Skip the next square. Again place the start of the Chenille-It in the upper left corner of the fourth square and run it down, diagonally to the bottom right corner of the fourth lower right square. Now carefully bring your runner, with the Chenille-It strips over to your machine to be stitched in place. Stitching of the Chenille-It is quite simple. Make sure you use thread to coordinate with your Chenille-It color to help camouflage any stitches once the project is complete and simply stitch a straight seam down the center of your Chenille-It strip. You do not need to backstitch at the beginning and end of the strip as the edges will be covered up in the binding. Also don’t get to hung up on having your seam smack dab in the middle. . .if it’s a little off it will be just fine in the end as it will be masked by the ragginess. Tip: We find that because we are working with a 3/8″ width of Chenille-It that a quarter-inch sewing foot (or walking foot) works the best for sewing this stuff down. When we use either of those feet we find that you don’t need to do any pinning because the foot holds the Chenille-It in place during the stitching. Play around with it while you sew and do what works best for you!! 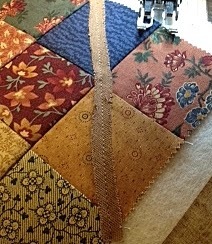 This is what your first Chenille-It strip will look like once you get your seam sewn. As you can see my line isn’t perfectly straight. . .but is in flows through the center of the Chenille-It strip. If yours looks like this, ya did well and it’s time to continue on!! 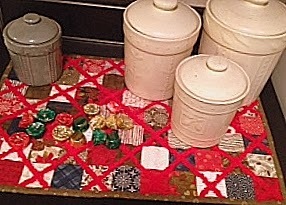 Continue to add Chenille-It strips like you just did in the steps above to the remainder of your table runner. Make sure you skip a square in-between your Chenille strips. When you are finished you should have something in front of you that looks like this. Now if you are like me you will make a quick detour to the kitchen to grab a can of Coke and couple cookies or chips before grabbing the roll of Chenille-It again. . .
To finish up the runner top we are going to add some more Chenille-It. You will note that we will be adding these going the opposite direction, but following the same format as last time. For purposes of explaining I am going to direct you from the upper left corner, as shown above. Just like last time, you are going to skip the upper left corner. Begin by laying the start of your Chenille-It strip on the lower left corner of the second square and roll it up diagonally to the upper right corner on the second square at the top and cut flush. Again, you will skip a square. 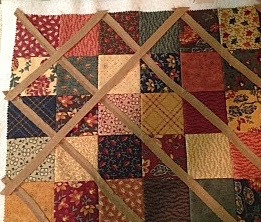 Start the end of your Chenille-It strip at the lower left corner of the fourth square and again roll it up diagonally to the upper right corner of the fourth square at the top and cut flush. Again, carefully bring your runner back to the sewing machine and stitch the Chenille-It strips in place. Once you have those first two strips sewn you you should see something similar to this in front of you. Continue to add strips to the project like you did in the steps above. Again make sure you skip a square in-between your Chenille-It strips. 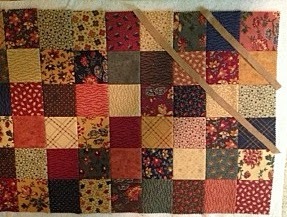 Once you have your Chenille-It strips all sewn down in place your table runner should look like the picture shown above. Again, if it does, ya did well and you can trim off that excess batting and backing!! Almost done!! Now you get to add the binding. Cut (3) 2 1/2″ strips for your binding. 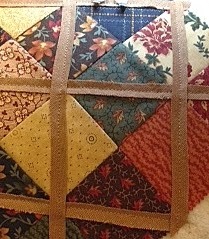 Sew the binding onto your quilt top. 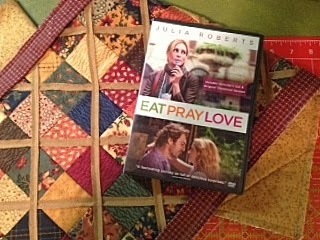 We chose to put it down hand, so if you choose to do that as well you might want to choose a movie (or TV show) and plop that binding on down. Now. . .the final step. Referencing a line from the movie “Leap Year” you can just “put it (bound table runner) in the wash. It’ll be grand!” Following the manufactures directions you will want to put it into the machine and wash it on a cold cycle. You can pick up where you left off in that movie you were watching until the machine is done washing. When the washer is done, simply toss it into the dryer and dry on a warm setting. Finish up that move just in time for the dryer to end it’s cycle and check out your new project! 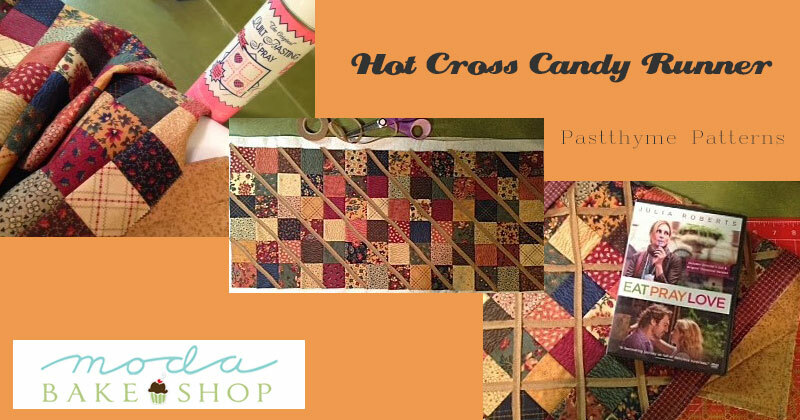 Your yield will be one “Hot Cross Candy” runner. . .perfect for a holiday gift or accessory to your table! 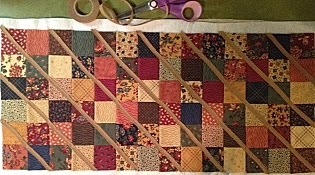 Your table runner will measure 12″ x 28″ upon completion. Remember that the sky is the limit with colors. Chenille-It comes in all sorts of fun colors to accent any project from Kansas Troubles to Bonnie & Camille and any other Moda designer’s color palate in-between!! See?! Even Nature’s Christmas by Sandy Gervais makes up a cute runner! This entry was posted in Easy, Moda Candy/Mini Charms/Petit Fours and tagged Kansas Troubles, pastthyme happenings, Sweet Pea, Table Runner.